How to distinguish from a client's language whether they are paying attention to a Problem, a proposed Remedy or a desired Outcome (PRO). How to respond to P, R or O statements in order to guide the client's attention towards their desired outcome. How to clarify what the client wants to achieve (in our opinion this forms the basis for the coaching contract). After years of training a variety of therapists, coaches, managers, teachers and facilitators from many persuasions we noted a frequently occurring pattern: Facilitators can easily be seduced by a client's problem. It is not surprising that a client can become so focussed on their problem that they become hypnotised by it, but we were regularly surprised when even experienced facilitators were unwittingly drawn deeper and deeper into the black hole of the client's problem. At the same time we noticed that we always seemed to have the choice to work with a client's problem or to invite them to attend to a desired outcome. Eventually we decided to model ourselves to find out: (a) How did we consistently detect when a client was attending to a problem or a desired outcome? and (b) How did we facilitate the client to shift to and maintain their attention on their desired outcome? To be clear, we are not saying focussing on outcomes is good and focussing on problems is bad. We are saying that at any moment facilitators should be able to choose whether they invite the client to attend to one or the other. It sounds simple and in the to and fro of interacting with a client it involves employing a number of skills. As a result of our self-modelling we discovered that we had internal signals that alerted us to when a client was describing a 'problem', a 'desired outcome' or a mixture of the two -- a 'remedy' (which we first called a 'solution'). We examined many client statements and unpicked the linguistic clues that were triggering our internal signals to go "Ah, that's a problem, that's a remedy, or that's a desired outcome." In this article we have presented our Problem, Remedy desired Outcome model in a formulaic way so that the three main components of the model (recognition, selection and utilisation) can be learned easily. The PRO model is not a change technique, it is a way to help you model a client's subjective reality and thereby facilitate them to self-model their own perceptions. Once you understand the basics and have practised enough, the process of using PRO when working live with your clients should become natural and flowing. Finally, PRO is not an end in itself, it the first part of a more complete coaching process called 'The Frameworks for Change' which we will describe in future articles. And PRO can be used in many other situations. For example, an educational consultant in the States who applied PRO to her work said it had improved her ability to keep meetings on track and to facilitate school administrators to shift from problem thinking to getting clear about what they really wanted. It made such a difference that she said "it was worth coming on your five day course just for that!" This sounds simple, but it takes substantial discipline to stop your emotions and anxiety long enough to simply refocus on what matters to you." Many clients are very good at telling you about their problem. And many ask a coach to help them find a remedy for their problem. But seldom do clients know that there is another category of experience that is an embodiment of what they want - their desired outcome. Over the last ten years we have taught and supervised many coaches and have noticed that, just like their clients, coaches do not need help to focus on a problem. A problem is like gravity - it draws the coach and the client into its orbit. We have also noticed that some coaches are content to help their client find remedies to their problems. For a relatively straightforward problem, a remedy may be just what is needed: if your computer crashes, perhaps it's better to call customer support than to call a coach to help you deal with your stress! However in the complex world faced by today's managers a remedy often ends up being a short-term fix and ignores the bigger picture. This is where a desired outcome comes in. Since clients are seldom outcome-orientated, it is important for coaches to spend a good amount of the time in a coaching session helping them fully develop their desired outcome (see Box 1). 1. By accessing the desired outcome state, the client's relationship with their problem may well change and they can access greater creativity and resources. 2. You and the client will know what they want to achieve and that keeps you both on track. 3. Often just finding out more about the desired outcome is enough for the client to make the changes they want, and no exploration of the problem and its causes is needed. For a coach to stay outcome-orientated requires constant vigilance; the ability to distinguish between P, R and O statements; and the ability to ask questions which consistently invite the client to attend to their desired outcome. But how do you recognise when a client is referring to a problem, a remedy or a desired outcome? Like it or not, problems motivate us. Actually it is not the problem itself that motivates, but the unpleasant feelings or effects that accompany a problem. For many, living rough would be a serious problem, but for a few people it is a chosen lifestyle. A problem, by our definition, is only a problem if the client says it is. A dislike for the current or a future situation is stated or implied. It does not contain any words of desire, e.g. want, need, would like. If a statement meets these two criteria, it's a problem (in red), e.g. This project is a lost cause. I hate it that my boss never listens to me. A remedy is a means of counteracting or eliminating something undesirable. If you listen carefully, most proposed remedies describe (in metaphor) how they expect the problem to be solved, e.g. I want to lose my fear of public speaking. I want to get rid of my fear of public speaking. I want my fear of public speaking to disappear. I want my fear of public speaking to go away. But a proposed remedy does not describe what the situation will be like after the remedy has been applied. The end result of a remedy, linguistically, is an absence - or not the problem. If the client loses their fear of public speaking, what do they have? With no desired outcome, they might not be frightened, but they could end up bored or boring! A remedy eliminates the problem but it does not set a direction for action once the remedy has been successfully applied. Contains a description of the problem. Contains a desire (e.g. want, need, would like) for the problem to not exist or to be reduced. The remedy (in purple) is always in relation to the problem (in red), but mixed in with it is also a desire for change (in green), e.g. I need to stop being pulled in lots of directions. I want to not have to repeat myself over and over. I want to put the mistakes of this team behind us. Desired outcomes describe how the world will be when the client has what they want. They differ from remedies because they are not a solution to a problem. When Michaelangelo set out to paint the ceiling of the Sistine chapel he knew he would have many problems to solve, but he wasn't trying to solve a problem - he wanted to create something. And that's a desired outcome. Contains a desire, want, need or would like, for a new situation, state or behaviour. Does not contain any reference to a problem (even though you may think you can guess what the problem is). For a statement to be a desired (in green) outcome (in blue) it must meet all three criteria, e.g. I'd like to be promoted. I want to be able to make tough decisions. I wish we could become a learning organisation. Is the client saying they want less of something, or more? If it's less, it's usually a proposed remedy. If it's more, it's usually a desired outcome. If neither, it's probably a problem. 1. I want to work together as a team. 2. I want my manager to stop micromanaging me. 3. I can't finish reports on time. 4. I'm tired of doing more than my fair share. 5. I'd like to be a confident presenter. 6. I don't want to be distracted from my goals. 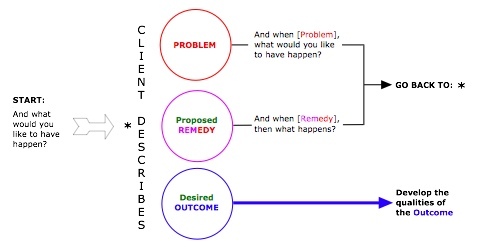 Now that you can identify the linguistic clues which define Problem, Remedies and desired Outcome statements, how do you respond when a client uses each kind of language? Diagram 2 depicts our approach to guiding the client's attention to their desired outcome. The key to using the PRO model is to use the client's exact words, and not to paraphrase or assume you know what they mean. In the following examples we make use of David Grove's Clean Language questions (see Carol Wilson's article Metaphor and Symbolic Modelling for Coaches in Coach the Coach, Issue 4, 2004), but there are plenty of other questions you might ask that would achieve a similar purpose. The advantage of Clean Language questions is that they introduce the minimum number of your words, thereby leaving the client the maximum freedom to express themselves in their words. And when [client's words for the problem] what would you like to have happen? Client: I've had enough of rushing to meet deadlines. Coach: And when you've had enough of rushing to meet deadlines, what would you like to have happen? And when [remedy part of the statement *], then what happens? * Only use the remedy part of the client's statement here, do not include their desire. e.g. Client: I want to stop having to rush so much. Coach: And when you stop having to rush so much, then what happens? what kind of [a portion of the outcome]? is there anything else about that [a portion of the outcome]? ** Only use the outcome part of the client's statement here, do not include their desire. e.g. Client: I want to meet my targets in a relaxed way? Coach: And when you meet your targets in a relaxed way, what kind of relaxed way? Using the PRO Model, write down the question you would ask of the six client statements in the previous exercise (answers at the end of the article). Box 3 is a summary of how to recognise and respond to a client's Problem, Remedy and desired Ouctome statements. Box 4 shows the beginning of a coaching session where the PRO model is used repeatedly to guide a client to describing their desired outcome. Start with: And what would you like to have happen? Something exists or is expected, X, that they don't like. A desire for problem, X, to not exist. A desire for a new something, Y, to exist. I'd like less of X.
I wish I could avoid X.
I need more of Y.
I would like to Y. Note: Sometimes it may be unclear to which PRO category a client's statement belongs. In this case, your next question should seek to clarify the direction of the client's thinking (e.g. ask 'And is there anything else?') before continuing with the PRO model. Note: Bold indicates the Clean Language questions. I get distracted so easily [pause], what was your question? And when you get distracted so easily, what would you like to have happen? I'd like to stop getting distracted of course. And when you stop getting distracted, then what happens? I can focus on the goals in my life. And when you focus on the goals in your life, what kind of focus is that? What did I just say? I've gone into my usual blank space. And when you've gone into your usual blank space, what would you like to have happen? I'd like to stay focussed, even when there are distractions all around. And what kind of stay focussed is that? Keeping to my own agenda. And is there anything else about keeping to your own agenda? Then I can shut down from worrying. And when you shut down from worrying, then what happens? I can juggle things and stay balanced. And what kind of stay balanced is that? And when you stay focussed, with more clarity and peace, and you can juggle things and stay balanced, relaxed and calm, whereabouts is that relaxed and calm? Whereabouts? It's throughout my whole body, but it sort of comes from here [touches stomach]. Coach: continues developing the clients embodied sense of their outcome. Making the distinction between the Problem, proposed Remedy, desired Outcome categories may initially seem a mechanical process. After a short while, when your internal signals are sufficiently well developed, you will easily recognise which class of experience the client is describing at any moment in time and know how to respond to keep them directed towards their desired outcome. The client will not only make PRO statements at the beginning, they will continue to make them throughout the coaching session. By listening carefully to what they say you will always know whether the client is paying attention to a problem, a remedy or a desired outcome. Then you will have choice about where you guide their attention. PRO can also be used to keep meetings on track, to keep a group in a creative state, to move people beyond conflict towards a joint outcome, or in numerous other productive ways. The PRO Model was designed in co-operation with Wendy Sullivan and Phil Swallow. © 2006, Penny Tompkins and James Lawley. And when you work together as a team, is there anything else about that work together? And when your manager stops micromanaging you, then what happens? And when you can't finish reports on time, what would you like to have happen? And when you're tired of doing more than your fair share, what would you like to have happen? And when you are a confident presenter, what kind of confident is that? And when you are not distracted from your goals, then what happens?